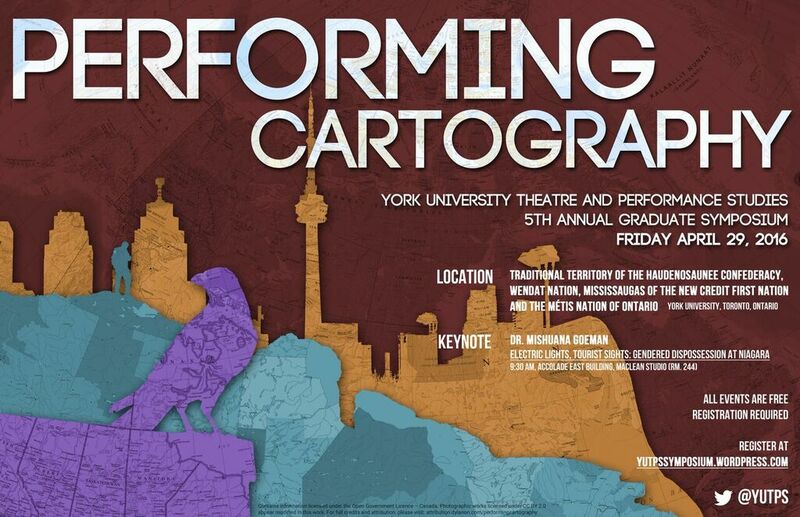 In less than a month, the York University Theatre and Performance Studies annual graduate symposium, "Performing Cartography" will take place, on 29 April 2016. The official schedule for the day will be posted within the next couple of weeks; we are currently in the process of mapping and (re)mapping our wonderful presenters and performers. Registration information is included on the website and on our poster, attached in this email. We very much hope that you can join us at our locale, to contribute to our thinking through the symposium’s themes. As we move towards Canada’s 150th birthday (2017) and its subsequent celebration, it is important to look back and consider the circumstances surrounding that birth. While carving out its own space, Canada violently displaced and dispossessed Indigenous peoples of Turtle Island. One of the ways this displacement and dispossession was (and continues to be) enacted is through the cartographic eye of the colonizer. Thinking about the performative act of cartography and how it has helped shape the settler state Canada, this symposium inquires what performance and indigenous forms of mapping can contribute to embodied or other alternative forms of mapping.